“I am so worried,” Zoe said. “My whole household is down with the flu. Except me. Well, I’m starting to cough. I don’t how much longer I can take the pressure,” she said. Saying “Don’t worry” won’t do Zoe any good at this moment. When’s the last time you have been seriously worried? Is it happening now? I’ve noticed that worry gets more intense about things we really cannot control. We, Wiccans, have an advantage: We can do an empowering ritual. This is a truly simple candle ritual you can do to get some relief from worry. Consecrate and charge your candle with your holy water and your incense. Dress your candle with your oil. Start belly-breathing (taking big breaths in and out—slowly) and light the candle. Envision all your worry and fretting going into the candle’s flame. That is, envision all your worry as a black smoke flowing out of your mouth with each breath out. The flame draws all the black smoke. Goddess take this from me. Continue your meditation on the candle, breathing out all your worries as the black smoke. When you’re done, thank the God and Goddess for Their support. Let the rest of the candle burn out. Warning: Never leave a candle burning unattended. May this ritual bring you relief and peace. A number of books serve as good resources for one to learn about Traditional Witchcraft. Here is a list of authors you can read about Traditional Witchcraft. Where is the Wiccan Wisdom? Nina bit her lip. I could tell she was angry. “Edna’s not wise; she’s just older!” Nina said. It can work the other way. Have you ever met a young person with an old soul? What about someone with a title? Does that make a big difference? This is on my mind because I was talking with a friend who asked about my accomplishing the third degree as a Gardnerian priestess. Yes, I’ve studied for years with fine mentors. I’ve put in many hours and much effort into earning the third degree designation. It’s a strange thing about human beings. We expect certain things. Some of us expect that people would put effort into becoming wiser as they aged. Still, we’ve seen people who just seem to stop in their maturity level. We expect, or at least hope, that someone with an advanced degree would show superior knowledge. My mentors whom I’ve admired have demonstrated two traits: kindness and humility. 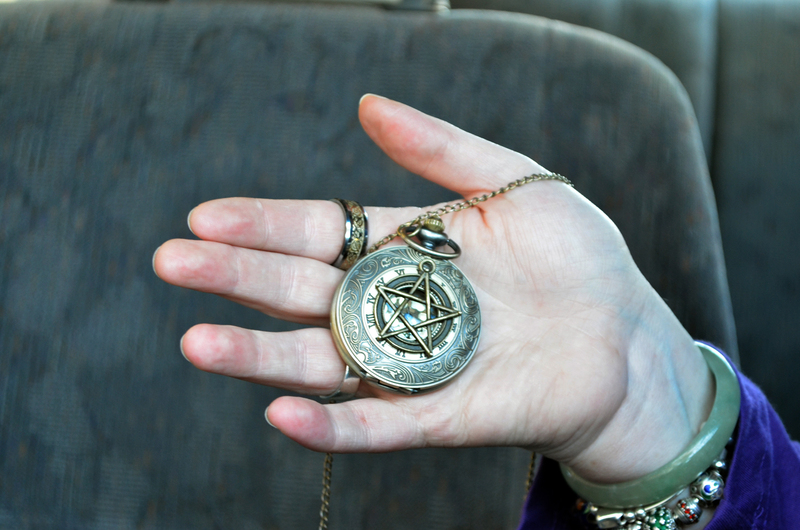 Wicca, to me, is a life-long journey in which I learn new things every week. Recently, I wrote about the 4 elements of the Witches Pyramid—which also includes Spirit. The great thing about meditating in the Wiccan way is that often we are given insights from the Gods and Goddesses. In essence, the more often you meditate, the more opportunities you have to receive guidance from the Gods and Goddesses. One of my favorite insights given to me is I am loved. This gave me higher self-esteem, and this gave me an understanding that I was not a horrible person which was a faulty idea that depression had slammed upon me. I invite you to keep meditating or to start a meditation practice. Open the door to a better understanding of yourself and the world around you. P.S. I will be away camping to connect with my Gods and will be returning Monday the 18th of May. Thank you to all my readers.